Later this week, Vietnam, Laos, and Cambodia will hold the first iteration of a new trilateral border exchange between them in Vietnam. Though the event was just one among many developments within the management of border relations between these countries, its significance nonetheless bears noting within the context of both regional developments on that front as well as Vietnam’s own priorities in this respect. As I have noted before in these pages, the countries through which the Mekong River – one of the world’s largest, longest rivers – have been working on ways to manage the opportunities and challenges that come from their shared borders, which extends from the highest levels of government down to local border guard units. Vietnam has been a key country in spearheading some of these efforts in terms of the border defense force, both as a key player in mainland Southeast Asia and given the role of the Vietnam Border Defense Force has played a critical role in preserving the country’s sovereignty and prosperity amid periods of conflict abroad as well as institutional contestation at home. 2018 has seen a focus on a number of these border exchanges, with a case in point being the third iteration of the Friendship Border Exchange Program held in August featuring border guard forces from six countries: Vietnam, China, Cambodia, Laos, Myanmar, and Thailand. The focus on these as much due to regional developments as they do with Vietnamese domestic ones as well: they are tied to a couple of key commemorations for the Vietnam Border Defense Force coming up in 2019, including the 60th anniversary of the establishment of the Border Defense Force, which occurred on March 3, 1959, as well as the 30th iteration of All People’s Border Guard Day dating back to March 3, 1989. 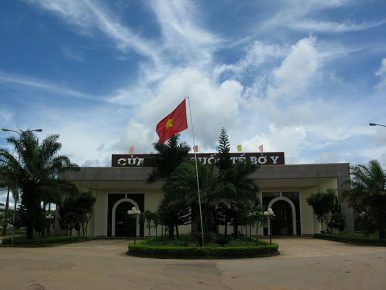 On October 25, the Vietnam defense ministry officially disclosed that the first Vietnam-Laos-Cambodia border friendship exchange would be held in early November. Per the agreement between the defense ministries on both sides as well as the provinces within these countries – Kon Tum in Vietnam; Ratanakiri in Cambodia; and Attapeu and Sekong in Laos – the exchange is scheduled to take place on November 2 and 3. The defense ministry said the activities planned included a joint patrol, a friendship seminar, planting of trees of a Vietnam-Laos-Cambodia border landmark, a free health check-up, and a medical drive. It characterized the exchange as a “remarkable cross-border activity” that would contribute to strengthening cooperation and development among the three countries and four provinces. Whether or not this actually lives up to that characterization remains to be seen. But as the border exchange gets underway later this week and we get details about how the three sides plan to follow up on such activities, we should have greater clarity about what this means for the relationship between them in this area.